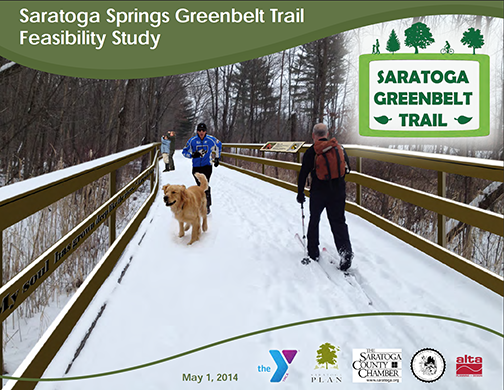 Please click on the cover artwork to view or download a PDF of the complete plan as written by Alta Planning + Design and approved by the City Council of Saratoga Springs in the Spring of 2014. For more on the key considerations that went into the plan, please scroll down. Trail Alignment and Connectivity: Looked at compatibility and linkage to existing trails (Spring Run, Bog Meadow, Railroad Run, Saratoga Spa State Park, etc.) to connect the city’s neighborhoods with the downtown business district and key destinations. Alignment Considerations: Evaluated opportunities and develop strategies for utilizing and/or acquiring private property and/or public right-of-way, as needed to create a continuous Americans with Disabilities Act (ADA) compliant trail along the prospective alignment alternative(s), with emphasis on minimizing conflicts between trail users, motorists, and property owners. Data Collection and Mapping: Identified, inventoried and described the existing physical and environmental conditions, vegetation and wildlife, land uses, property ownership, roads and their characteristics, key crossing, easements and rights of way in the study area. Demand and Benefits Analysis: Determined the potential use, environmental, health, mobility and economic benefits of the proposed trail.